It's always fun to walk into the kitchen clueless as to what I'm going to cook for dinner, just grab a few ingredients and then invent a dish as I go along. As I've mentioned before, I'm a huge fan of stuffed/wrapped meals. Multiple layers and textures are a great way to make any dish interesting. It all started with a cabbage. I first thought I'd be making stuffed cabbage rolls but because it was raining, I had a hankering for deep fried goodies. So I decided to make cabbage patties and then make them healthier (I say 'ier' because deep fried or not, veggies are healthy to begin with) by turning them into whole wheat wraps with raw veggies and a nice pesto. Heat the oil in a wide pan or wok. Place the rest of the ingredients together in a large bowl. Add a little bit of water and mix to form into a rough ball of dough. It should hold its shape (add a little more fried gram flour if required) Pinch off little bits, form them into balls and flatten them into a patty shape. Deep fry them, a couple at a time, on medium flame until golden brown and keep aside on a plate layered with tissue paper so any oil can get absorbed. Blend everything, except for the olive oil, together into a smooth paste using a little bit of filtered water. After it's smooth, keep the blender running and drizzle in the olive oil so it gets incorporated well. Transfer to an airtight container and keep aside. This pesto will keep well in the fridge for at least a week when stored properly. 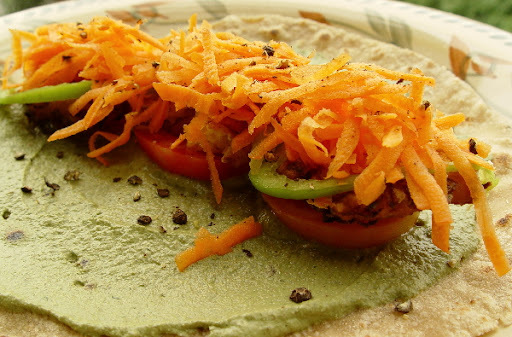 Place a chapathi on a flat surface and spread the pesto on it evenly in a thin layer. In the center, place three slices of tomatoes in a vertical line. Place the cabbage patties on the tomato slices. Top with green bell pepper strips and grated carrot. 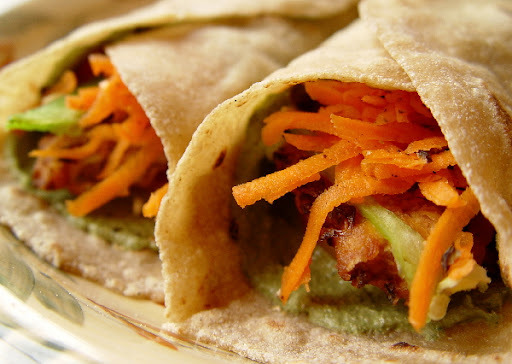 Crush pepper over everything and roll up the chapati snugly to form a wrap. wow! this looks and sounds really yummy too! I wish you could cook it for me! I'm looking for more vegetarian meals now that I have my gallbladder out. Thanks for sharing! The pesto in the this recipe is easy to make. It's just the cabbage patties which take some effort. You could buy falafel mix, shape and bake the patties for a healthier and easier alternative instead of deep frying and use those in the wraps instead. Terry, loads of finely chopped/shredded onions are the best combination with besan. You put in the onions, curry leaves, chilli powder, salt, coriander powder, cumin powder and chopped cilantro. Make a thick batter and drop them by spoonfuls into the oil and deep fry them into crunchy Pakoras. YUM!! I haven't tried combining zucchini with besan yet. Thanks for the idea. :) Do you bake or deep fry your patties?